Careful calligraphy, or writing and painting of letters, is truly elegant. 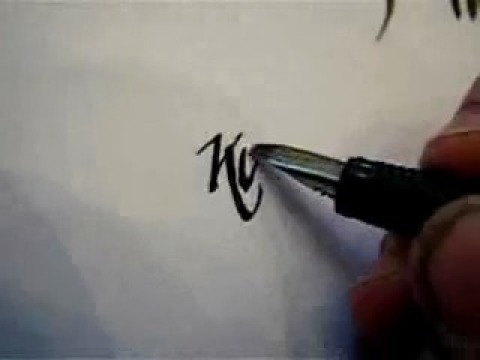 Words and symbols can be visually attractive if they are beautifully written using calligraphy by an accomplished artist. A special calligraphic pen or brush is used to great effect to achieve graceful lines and beautiful effects on the artistically designed, handwritten page. Quiz: Try again! What is calligraphy? The tools used to inscribe beautiful print. The act of designing an alphabet. Calligraphy is the art of beautiful handwriting using special pens or brushes. Calli's Graphs are Beautiful Although most people wouldn't call hand-drawn mathematical graphs beautiful, Calli does hers so precisely and accurately that her impressed math teacher says Calli's graphs could be considered calligraphy because they are the best he's ever seen. Calligraphy Tool The Rotring Artpen.